A board-certified physician assistant, Anna received her bachelor of science in biology/pre-medicine degree from Coastal Carolina University in South Carolina. She pursued graduate studies at Nova Southeastern University in Fort Lauderdale, where she earned a bachelor of science in physician assistant studies and a master of medical science in 2003. For three years prior to joining Water’s Edge Dermatology in 2006, Anna was employed by a Mohs surgeon, dermatopathologist, and cosmetic dermatologist in Miami Beach, Florida. Anna chose to specialize in dermatology because of the diversity of the field. 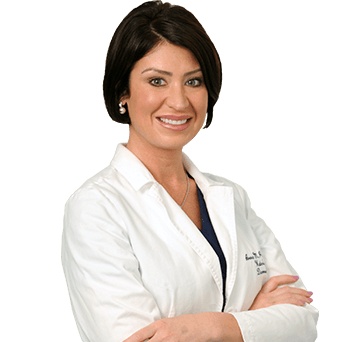 From Mohs surgical technique for skin cancer removal and the subsequent reconstructive surgery, to cosmetic enhancement and general dermatology, Anna takes pride in and is motivated by the various aspects of her specialty. When Anna relocated to the Palm Beach area, someone recommended Water’s Edge Dermatology and Dr. Ted Schiff. From her first day at Water’s Edge, Anna admired Dr. Schiff as well as the other physicians, physician assistants, nurses, and office staff for their tender care, compassion, intellect, and dedication to the patients. She appreciates the well-run organizational aspects of the practice, including scheduling, diagnosis, and treatment protocols and follow-ups. Anna also found it refreshing to see Dr. Schiff treat his colleagues and staff with respect and gratitude. Anna is part of the patch testing clinic at Water’s Edge Dermatology. She trained with Dr. Sharon Jacobs at the University of Miami and performs the university-level comprehensive patch testing in many of our offices. Anna works closely with Dr. Schiff, as well as other colleagues in the practice, and continues to observe and respect just how much time, effort, commitment and loyalty Dr. Schiff has put forth to create a network of offices and staff that provide exceptional and unconditional medical service to every patient that walks through the door. Anna believes Water’s Edge Dermatology is an exceptional dermatology practice and she is honored to be a member of the Water’s Edge family. No matter what time of day or night a skin problem or skincare need should appear, please use this form to request an appointment. From acne and alopecia to venous disease and vitiligo; get the definitions, explanations and facts you need about virtually any and all dermatologic conditions and skin diseases, in easy alphabetic order! Many of our dermatology providers are featured in the collection, and most leading skin disorders are covered. Learn more about prevention, diagnosis and treatment options for your condition, and hear what other patients have to say about us! Watch educational videos & more! Get special offers, invites & more! Copyright © 2018 Water's Edge Dermatology. All Rights Reserved.